Gift Vouchers include free shipping and free personalization. 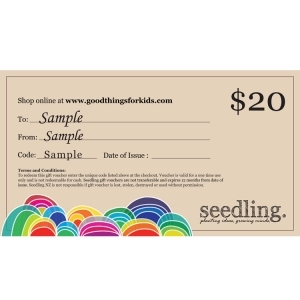 Once a gift voucher is purchased, email info@goodthingsforkids.com with the name of the recipient and any additional messaging you would like. In a HURRY? eVouchers by email are also available! Terms and Conditions: Voucher is valid for a one time use only and is not redeemable for cash. 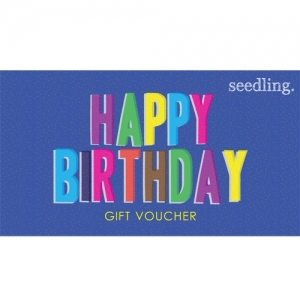 Seedling gift vouchers are not transferable and expires 12 months from date of issue. 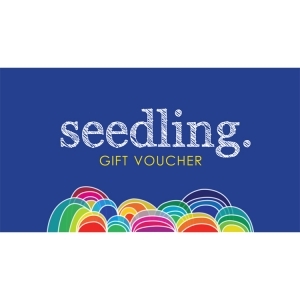 Seedling NZ is not responsible if gift voucher is lost, stolen, destroyed or used without permission.